down again... - A mummy's inane blabberings..
*Sigh* I rejoiced too soon. Aidan's down with fever. It's actually only the 2nd time since he was born that he had fever. Temperature was quite high..about 39.8% to 40%. 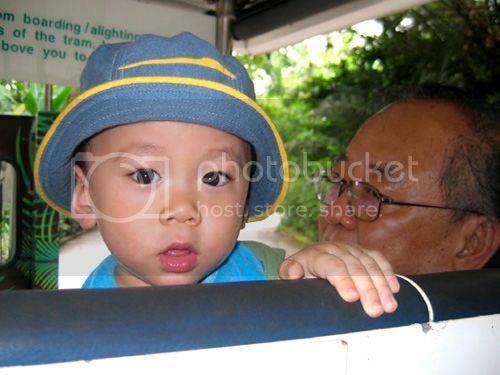 We were at the zoo on Friday when he started becoming feverish. Both ahbang and I were on leave that day and I'd thought that going to the zoo would be a good idea to spend some family time. He was fine initially but much later, it was obvious something wasn't right when his forehead and body became really hot. For a while, I was afraid he was suffering from heatstroke but mil assured me that it couldn't be so. So we cut short our zoo expedition and headed home which was really fortunate because it started to rain cats & dogs the minute we reached the car. We did everything we could to cool him down..Sponged him with tepid water, get him to drink more liquids, gave him paracetamol, put the fever patch on for him and let him lay down/sleep on the 'taxi-mat'. His temperature yo-yo-ing like crazy..dipping to 38% and then after a few hours, it got back to a high 39 again. He was also having shivers.. We got more worried & took him to the paed today. His tonsils were apparently inflamed. Said that the fever was probably due to his infected tonsils too but she wanted to rule out UTI so we have to bring him back tomorrow morning so that they can collect his urine in a sterile environment. Initially, we were worried that it could be HFMD because it seemed that lotsa kids got it recently..Aidan had an ulcer on his tongue and some sores on his mouth but the paed said Aidan most likely bit his tongue and that his dry lips was because he was feeling dehydrated. Appetite wise..he's fine but we could tell he was having problems swallowing..Thankfully, he actually enjoys taking his meds. His temperature continued to rise and fall throughout the day..so did his temperament. When the fever was under control, he was hyper and active, playing with his toys and running around the house gleefully. But when his temperature was over 39%, he became clingy and wanted to just lie around or watch tv. Thankfully before he slept, his temperature was normal again. Would have to monitor him closely through the night. I really felt guilty initially for suggesting going to the zoo.. I kept reproaching myself for it. I thought that he may got infected there or that his condition wouldn't be that bad if we were at home resting. When the doctor assured me that it wasn't possible that he could have caught anything from the zoo and that he probably was infected a while ago, it made me feel slightly better. I guess what made his tonsils worse was that he had popcorn chicken at Kentucks for lunch and we let him eat alot of it.. I gotta stop having such feelings of guilt. It is stressing me out. I'm constantly wondering whether going back to work was a good idea afterall. My boy is getting sick every other week! I do admit, I am enjoying what I'm doing now. The job isn't tough nor stressful and I like the environment and colleagues...you know lah, I'm so into stuff like the media & entertainment. But then again, the job/company may not be that stable especially with so many rumours going around about possible mergers and closure of stations.. Everyone in the company (and the rival company too) is awaiting for news and wondering which 'rumour' would be proven accurate. 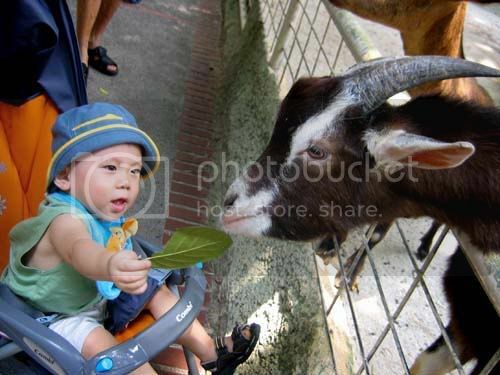 Pics at the zoo before Aidan got sick.. 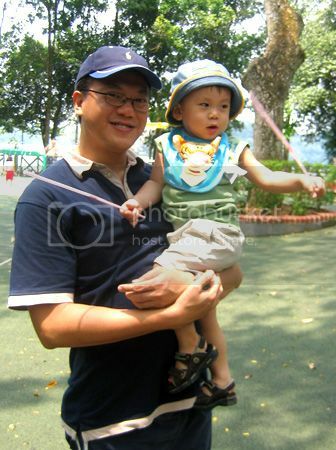 I ♥ this pic of Aidan and his dad..
Hope Aidan gets well soon. Hey, there's nothing you should feel guilty about since you have your lil one's best interest at heart. That's the problem with us mothers, isn't it? Whenever things go wrong, we blame ourselves. as a mom urself..i guess u can identify with how i feel..it's tough lah. 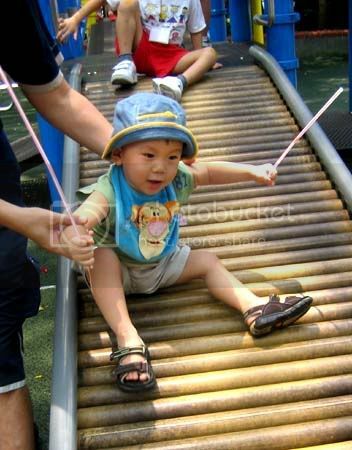 *sigh* Hate to see my boy falling ill so often..
Aidan looks like a Japanese in these photos. Don't get too depressed over Aidan falling sick. He's been in childcare and having more exposure to all these sicknesses. He needs to build up immunity to all these viruses .... it's not your fault. But as mums, it's natural for us to have these feelings of guilt. Just don't be too hard on yourself. Great that you're enjoying your job - no stress some more, shiok man. I also want to find this type of job next time! it's not easy watching our kids get ill..all moms can identify i guess..I hope thru it all, he'll become a healthier and stronger child. yeah thankfully he didnt go..Doc diagnosed him with HFMD today..he could have infected the other kids. oh boy, hope aidan gets well soon!! Yeah..all the doctors told me that Aidan falling ill so often is inevitable as he's exposed to so many kids at the playschool..But, it's really sian watching him getting sick so often..It's really every other week since he started school. I guess my lamenting and constant writing of my guilt seems so self-indulgent. like my bitching and complaining about stupid people? heh i know it's natural to feel like that but as long there's a little bit of you that understands it's really not your fault, all wil be well. 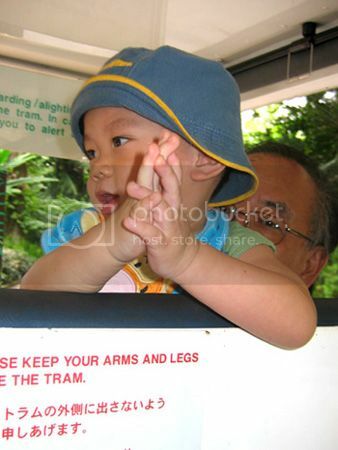 yeah boy..u can say that again..But then, we'd gone to the zoo so many other times before and he was fine. You know..really hate that helpless feeling when our kids fall ill. When doct said it could be UTI initially, i was like argh..I just hope he won't ever get it..Damien's better now i hope..
Hey babe, I can understand how sim tia you are. I would feel the same way too. Sigh, I suppose it's inevitable because our kids are still young and their immunity systems are not that strong yet. A friend of mine told me her son fell sick on and off for 6 mths since he started school and he is much better now. I hope Aidan get well soon and you take good care of yourself too. As for the job, even if there's a merger, you'll still be in the business and doing what you enjoy. Don't think so far. Just let it be natural. yeah..the docs always tell me that with each illness, his immune system gets stronger and i really hope so..again, it pains me so much to see him so weak all the time.. But yeah, we cant be too paranoid too..im trying my best to look at the positive side of things. Thanks! reading my lj fren backwards. stop bashing yourself. kids in c/c and p/g are more prone to catch a virus so it's not becoz you brought aidan anywhere. i know i know..but at that moment, i couldnt help but berate myself. I guess it's a natural reaction.